At Ultra Clean Melbourne, we pride ourselves on providing high quality, low cost professional cleaning services that exceed your expectations. We have highly trained and fully insured specialist technicians working flexible hours seven days a week. So no matter how big or dirty the cleaning task, we have the skills, experience and the best equipment to handle it with ease. Our team of specialist technicians use bio-degradable, non-toxic, hypo-allergenic products and the very latest in cleaning technology. Ultra Clean Melbourne is a family owned, referral based business. Spending less on marketing allows us to pass along our savings to you – Our valued client! More saving for you ensures that when you choose Ultra Clean Melbourne, you get the best possible cleaning service for the best possible price in Melbourne and surrounding areas. We provide a range of professional cleaning services including carpet cleaning, upholstery cleaning, rug steam cleaning, mattress steam cleaning, tile & grout cleaning, leather cleaning and couch cleaning. We stand by our work and offer 100% customer satisfaction guarantee. Customer satisfaction is paramount to us, therefore we do not hire sub-contractors in order to ensure that our quality of service is the best in Melbourne. Our friendly and reliable team understands your needs. 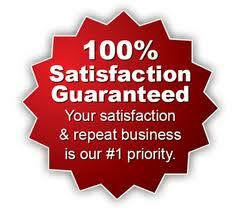 We offer a 100% satisfaction guarantee. Our goal is to provide you with the most outstanding service experience you have ever received. Based on realistic outcomes, if you are not delighted with the cleaning service experience you receive from us, we will rush back to your location and remedy the situation. You therefore really have nothing to lose when hiring our services. We can make such an offer because we believe in our service. This is an iron clad guarantee provided by a family business that does not hire sub contractors, we care about you and the results we achieve for you. For a FREE quote or an appointment, call 03 909 309 40 today. Be sure to like us on Facebook to take advantage of more special offers. I would highly recommend Bruce to clean your carpets. He was courteous, reliable and flexible as I needed the job done on a Saturday. Very happy with the result and I have received my full rental bond back. Happy with the price quoted and it did not change after the job was completed. My partner and I would like to highly recommend Bruce and Ultra Clean Melbourne for his exceptional steam cleaning of our carpets today. Bruce was able to remove ingrained, heavy stains and leave our carpets looking amazing ! The service was exceptional, Bruce arrived on time, was considerate, honest and professional. I don’t normally review businesses but I was so impressed I wanted to take the time to highly recommend this service. Thank you Bruce. Bruce did a great job of cleaning our carpet and lounge suite. He was very thorough, our lounge suite looks brand new. We would not hesitate to recommend this company and will use them again. Thanks Bruce for a fabulous job at a very competitive price. Bruce please accept my sincere thanks for your excellent service (at very short notice!) I am thrilled with the Steam Cleaning of my carpets, can’t believe how good they look especially where the metal legs of our old Lounge had made deep indentations, the ‘holes’ have 99 per cent disappeared, how you did that is amazing and I will certainly recommend you. Again, my sincere thanks – will be in touch next year. The service provided by Ultra Clean Melbourne and Bruce in particular was excellent. He was able to come on a Sunday. The care and effort Bruce took with our furniture and the cleaning of our couches and carpets was excellent. Extra effort and care was required as we have pets. The carpets and couches have come up beautifully. Bruce was on time and very friendly and the price was very competitive. I don’t normally do reviews, but I had my carpets cleaned by Bruce today and was very happy with the service and result. Bruce had a lovely manner and I would recommend him to anyone. I have had furniture cleaned last year and carpets this year by Bruce. Absolutely excellent and meticulous work. I have no hesitation in recommending him to my friends. The service provided by Ultra Clean Melbourne was outstanding, he arrived before the time allocated, was very professional, and due to living in a rental property with many tenants before us and pets able to be inside there where quite a few stains, however the carpets improved 100%. Very happy with the service, would recommend to anyone at end of lease or a home owner wanting to spring clean. Will definitely use this service in the future. Bruce was on time, very professional and a lovely man. My carpets were quite dirty and Bruce brought them up better than I expected, very impressed and the price was Great. I will recommend Bruce to anyone who wants an excellent job done!!! Thanks very much Bruce. Bruce did a fantastic job steam cleaning my lounge suite and carpets. I’ve recommended him to family and friends. Thank you for the amazing services and excellent job! Appreciated for the carpet cleaning services. Absolutely AMAZING service and would recommend this carpet cleaning company to everybody, excellent job. Thanks. Thank you so much Bruce for a wonderful job today! Carpets look great. As always, you do a fabulous job!! A thorough job and friendly guy. Doing a little House Spring cleaning, these People are so…..nice and have good deals as well. Copyright © 2012-2019 www.ultracleanmelbourne.com.au. All rights reserved.